Each day I try to optimise my workflow at work. Any second not spending on the actual work is a second wasted. Each step/click in your workflow should be optimised so you can work as efficient as possible. More efficiency means less labor and bigger margins. I’m not going to share the obvious productivity tools you can easily find on Google, most of you already using tools like Dropbox, Google Docs etc. These are my Top 6 tools which I use everyday (+10 extra Apps). This tool is extremely useful, a colleague of my thought it was “life-saving”. What is does is saving ALL (except passwords, but you can customise this) pasting you do on Mac. You can search your “Pastes” and paste it as Plain Text easily using the Hot keys. When you do a CMD+C you can “recall” all pastes using a hotkey. I use CMD+SHIFT+V for that. By doing this you will get a pop-up. This is extremely useful if you want to look up a link you copied, if you need to copy multiple separated sentences or if you just want to create “Snippets” of texts (for example you can use it to create text templates). Do you organise your Mac files manually? If you’re the kind of user that sorts it computer manually but sorting files, deleting files, organising files than you can save loads of time by using this tool. You can create all kind of “rules” to sort your computer. For example if a file is a ZIP archive and older than 30 days you can automatically trash it. Or if you have a PDF file older than 7 days you can archive it automatically into subfolders. You can keep your Mac automatically organised by using this tool. It saves me a lot of time. You can also use it as a more creative tool to automate billing processes, spreading files on various Dropbox Folders automatically and much more. This is for those who works with the Mac Mail App. I really love the Mac Mail app but in search of a more advanced Mail App I was disappointed by alternatives as I don’t want to use Cloud Mail such as Google Apps. Therefore I was looking for Plugins to make Mac Mail more advanced. After some testing I found MailButler. In the last 12 months they added tons of new features, I like how they keep innovating at a fast pace. Basically this Plugin for Mac Mail gives Mac Mail tons of new extra features. Such as Mail Tracking (You can track Mail clicks opens and more, Auto-follow up (reminder), Mail scheduling (You can schedule mails) and much more. The biggest feature is the Follow Up reminder feature so you can easily check box “follow up” and it will set a reminder when the receiver is NOT replying. The reminder will be archived if the receiver replied so you don’t have to check reminders yourself. Chef Folder organises your folder automatically. If you want to quick fix your folder than this is the app to go. For example, if your desktop is messy, you can just open this app, select the folder and click Organise. It will organise your files automatically in subfolders (Images/Sounds/Texts etc). It’s also customisable. Another great tool to organise your Mac. With this tool you can track down duplicate files on your computer and get rid of it! Be careful which files you’re deleting though! A great automation tool for Mac. You can trigger an automation by using a keystroke (a word) or hitting a custom hot key. You can automate anything, you can automate a Mail (include body text etc), you can automate mouse clicks and much more. You don’t need to know how to program it as you can use the record automation tool! If you do repetitive work than use this tool to create an extreme short cut. This tool puts all your communication tools together. For example you can have WhatsApp, Messenger, Slack, Skype in one app. This keep your communication tools organised. Very neat fast image editing software. I use this to blur out sensitive info, to create clear green arrows and much more. Must have! Extra: 8 Other (more known) tools I use! 1Password // If you’re wasting time looking up passwords or creditcard info than this is your app. You will never wast time filling in passwords again. Also useful to have your creditcard numbers in one place. The iPhone App and browser plugins will save you a lot of time. VLC // I use this to watch all kind of video files (you won’t lose time by getting playback errors because this app plays every video file you can image. I also use it to make High Quality “stills”. You can do that by the hotkey option-alt + CMD + S. An export of the still will be sitting in your Pictures Folder. This is great trick to get a thumbnail FAST! I just press that short key 5 times a second to get some cool options. Dropbox // The #1 for organising your Cloud folders. Share files easily on the road using the app. I can’t live without this App. It’s going to launch a new feature soon so you don’t have to “selective sync” your computer anymore to save space. Just like iCloud Drive. Automator // This is the Mac’s native automation app. It can do anything. Worth looking into it. I run a script to optimise my Mac Mail library. See here. HD Cleaner // This can clean your Mac in SECONDS. It cleans your trash, logs. caches, old mac downloads and much more. It will look for files you will never use again. Gif Brewery // High quality video to GIF converter tool. This is the best app I could find! Quicktime Player // Native Mac App. I use this to record my screen, the iPhone screen and much more. High Quality screen recording tool. 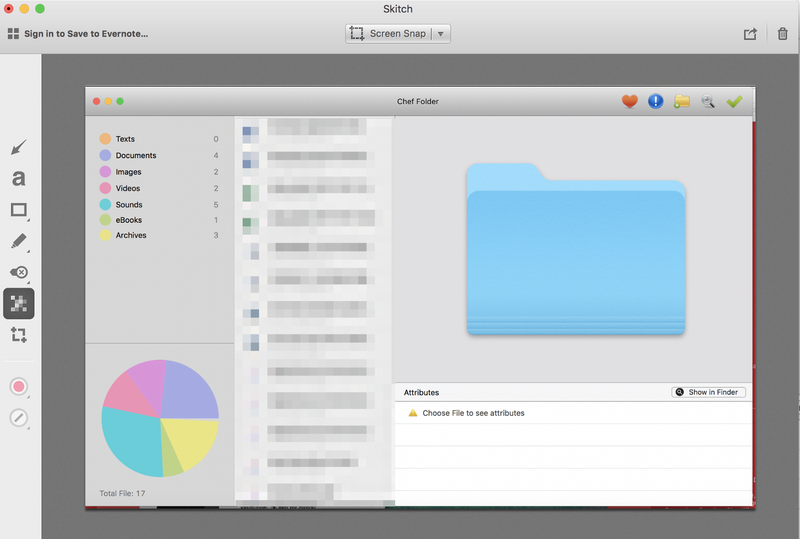 Skitch in Action, editing a Chef Folder Screenshot. Sebastien Lintz | Label/Artist Manager/Producer @Revealedrec @SortedMGMT Views expressed are my own.